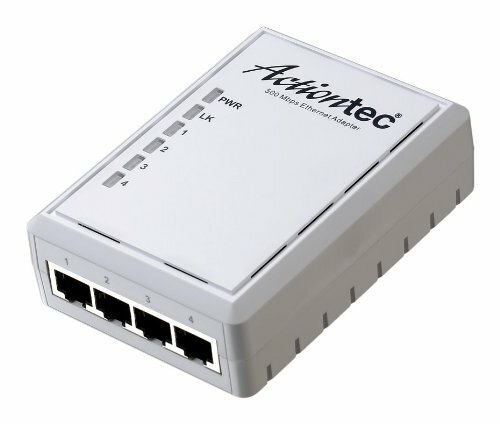 Use this single, 4-port adapter to expand your existing Actiontec 500 Mbps Home Theater network. This network connects your Home Theater to the Internet using your home power outlets. Use the 4-port hub to simultaneously bring internet access to your gaming console, TiVo, set top box, and smart HDTV. Use the extremely fast throughput to run four devices at maximum capacity. This product is compatible with any networking device that has an Ethernet port. Powerline adapters can reach locations wireless cannot, so they are excellent solutions for computers, home theater and gaming devices. 128-bit AES pushbutton security keeps your network safe. You can further expand this network with additional single, 4-port or wireless adapters. Setup is easy. No installation disk required! Simultaneously connect your gaming console, TiVo, set top box and smart HDTV at the same time. Easy setup: Simply plug in to your power outlets and no installation disks. More reliable signal than wireless and reaches locations wireless adapters can't, including garages and basements. Works with any Ethernet-enabled device. More secure than wireless! 128-bit AES pushbutton security with key management. Powerline adapters require at least two units to create a network. PWR514WB1 should be considered an add-on unit to any existing Powerline product. Other Actiontec Powerline products include PWR514K01, PWR511K01, PWR51WK01 and PWR511WB1.